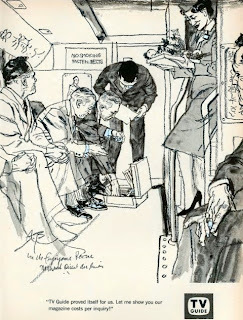 This 1960 TV Guide ad features a business meeting in the Fujiyama Room of a Northwest Orient Airlines Boeing B-377 Stratocruiser, just a couple of months after I resigned (because I got married). The ad targets execs in advertising and publicity departments who must decide where to purchase advertising space. Note the hand-written caption on the lower left, next to a man's shoe. I remember carrying the huge Fujiyama Tray down the tiny circular staircase in my 4-inch high heels, too. I write anecdotes about the Fujiyama Room in my book, "Fujiyama Trays & Oshibori Towels, Recalling a time when passenger flight was an adventure and the Boeing Stratocruiser ruled the skies." Ironically, I began working for TV Guide magazine some months later in 1960. All of their midwest magazines were produced in Minneapolis at the time. Thanks to Bob DuBert for alerting me to this ad, which he found in a book he recently purchased, "The Complete New Yorker," a retrospective of the first 80 years of the magazine, 1925 - 2005. The book comes with eight DVD-Roms, which include every page of every magazine. When he told me the book was priced at $100, but he purchased it for $9.99, I bought one myself, in spite of his disclaimer that it was addictive. Thanks, Bob!